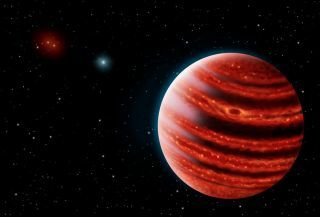 An artist's depiction of the "young Jupiter" exoplanet 51 Eridani b in near-infrared light. The planet twice the mass of Jupiter and is the smallest exoplanet yet seen using direct-imaging techniques. Astronomers have found the smallest planet outside this solar system yet to be directly photographed by a telescope on Earth, a methane-shrouded gas giant much like a young Jupiter. This newfound alien planet, called 51 Eridani b, orbits a star about 96 light-years from Earth in a planetary system that may be much like Earth's own solar system. The discovery could shed light on how our solar system formed, scientists added. More than 1,000 of the exoplanets confirmed to date were discovered by NASA's Kepler Space Telescope. Kepler indirectly finds planets by detecting a loss of starlight as a world passes in front of its star. However, this new planet was discovered using the Gemini Planet Imager, an instrument on the Gemini South telescope in Chile, which directly detects exoplanets by looking for light from the worlds themselves. "To detect planets, Kepler sees their shadow," study lead author Bruce Macintosh, lead investigator on the Gemini Planet Imager and an astrophysicist at Stanford University in California, said in a statement. "The Gemini Planet Imager instead sees their glow, which we refer to as direct imaging." The scientists detailed their findings online Aug. 13 in the journal Science. Exoplanet 51 Eridani b, a world only 20 million years old and still hot from its creation, has been photographed in a solar system 96 light-years from Earth. Learn all about 51 Eridani b in our full infographic. The imager, which is about the size of a small car, is perched atop the 26-foot (8 meters) Gemini South Telescope. It relies on deformable mirrors known as adaptive optics to sharpen images of stars, and then masks their light. Any remaining incoming light is then analyzed, with the brightest spots hinting at possible worlds. Scientists focused on 51 Eridani, a yellow-white dwarf star about 1.5 times the mass and diameter of the sun located roughly 96 light-years away from Earth in the Southern Hemisphere constellation Eridanus. This star, also known as 51 Eri, is very young, only 20 million years old. In comparison, the sun is about 4.6 billion years old. Young stars and planetary systems in the early ages of development can shed light on how Earth's solar system was born and evolved. 51 Eri is one of 600 young stars within about 300 light-years of Earth that the Gemini Planet Imager is slated to analyze in the next three years. So far, researchers have scanned nearly 100 of these stars. "51 Eri is one of the best stars for imaging young planets," study co-author Eric Nielsen at Stanford University and the SETI Institute, said in a statement. "It's one of the very youngest stars this close to the sun. 51 Eri was born 20 million years ago, 40 million years after the dinosaurs died out." 51 Eridani b, or 51 Eri b as it is also known, is more than a million times fainter than its star, and it still glows from the heat of its creation. The planet orbits its star at a distance of about 13 astronomical units, or about 13 times the span between Earth and the sun. This is between the distances of Saturn and Uranus from the sun. One astronomical unit is about 93 million miles (150 million kilometers). Planet 51 Eri b was discovered only a month after the Gemini Planet Imager began operations, in 2014. "This is the first exoplanet discovered with the Gemini Planet Imager," study co-author Franck Marchis, senior planetary astronomer at the SETI Institute, said in a statement. "Gemini Planet Imager is far more sensitive than its predecessors. In fact, the 51 Eri system had been observed by four previous-generation instruments that all missed the planet completely." 51 Eri b is only about twice the mass of Jupiter. "51 Eri b is in many ways a young Jupiter," Macintosh told Space.com. "In the atmospheres of the cold-giant planets of our solar system, carbon is found as methane, unlike most exoplanets, where carbon has mostly been found in the form of carbon monoxide," study co-author Mark Marley, an astrophysicist at NASA Ames Research Center, said in a statement. "Since the atmosphere of 51 Eri b is also methane rich, it signifies that this planet is well on its way to becoming a cousin of our own familiar Jupiter." The researchers suggest that 51 Eri b, as a sort of young Jupiter, might be forming much like giant planets did in the solar system, as opposed to the manner in which researchers suspect radically different worlds such as hot Jupiters formed elsewhere in the universe. Astronomers think that the gas giants in the solar system arose by growing large rocky cores over a few million years and then pulling in huge amounts of hydrogen and other gases around themselves to form atmospheres. However, the gas giants that astronomers have directly imaged around other stars until now have been relatively hot, at about 1,200 degrees Fahrenheit (650 degrees Celsius), compared to the temperature of Jupiter, which is about minus 234 degrees Fahrenheit (minus 145 degrees Celsius). This heat suggests these far-off gas giants might have formed much faster than the solar system's gas giants, with their ingredients gravitationally attracting together and collapsing rapidly to make searing-hot planets. The scientists found that 51 Eri b is relatively cool, at about 800 degrees F (430 degrees C). While this is still hot enough to melt lead, it is cool enough to be consistent with the cold-start-formation mechanism, the researchers said. "This planet really could have formed the same way Jupiter did — this whole planetary system could be a lot like ours," Macintosh said in a statement. "How all the weird systems we see and Kepler sees got to be there is the biggest exoplanet question right now, and everything we can do to understand it is critical." The researchers said they plan to begin observing 51 Eri b again in late September, when it emerges from behind the sun, in order to map out the exoplanet's orbit. "If it's going in a nice circular orbit like Jupiter, that'd be really exciting," Macintosh said. "If it's in a weird orbit, that's really exciting, too."